Running with SD Mom: My Long Run routine and a Hydration GIVEAWAY! Do you know what a Flat Runner is? 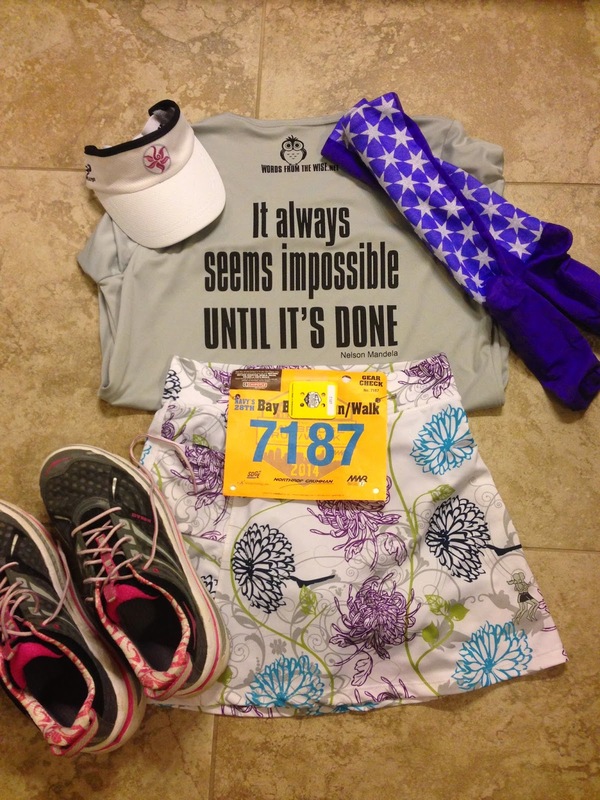 It is when you lay out your outfit for a race and take a picture so others can spot you at the race or run. Well, for me, a Flat Runner is a part of every long run. I lay out my outfits the night before. 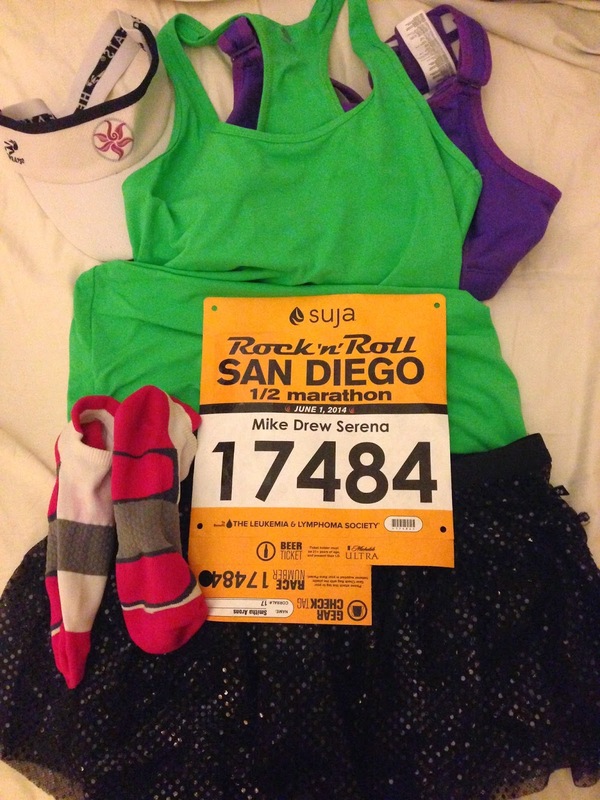 And I mean everything from my Headsweats visor to my Crazy Compression socks to my Running Skirt. I like to be prepared...so much so that I prep all my nutrition needs for the race the night before too. 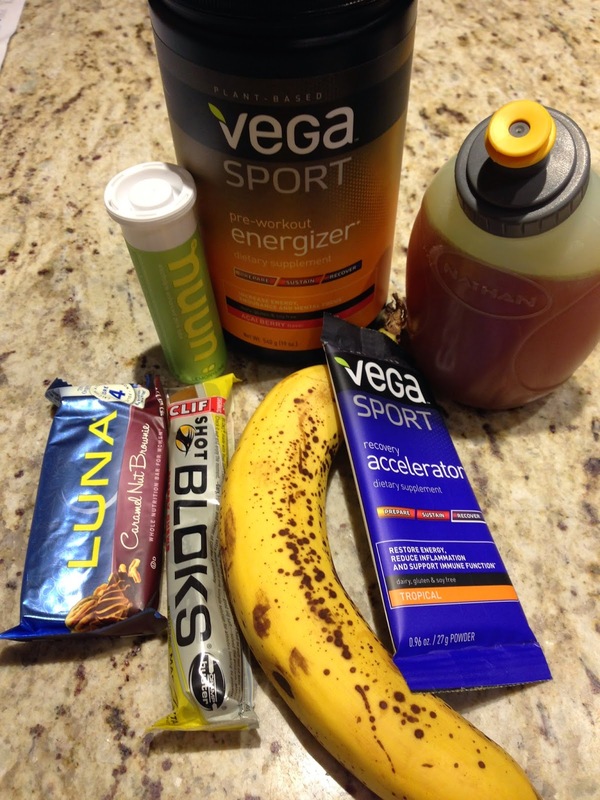 Clockwise: Nuun Lemon Lime (for during the run), Vega Energizer (prepped for 20 minutes before), Vega Recovery Accelerator (for after the run), Banana (duh! ), Clif Shot Bloks (for during) and a Luna Bar (1/2 a bar before). Turns out I am not the only one who loves Nuun! A lot of you do and a lot of famous athletes do too! 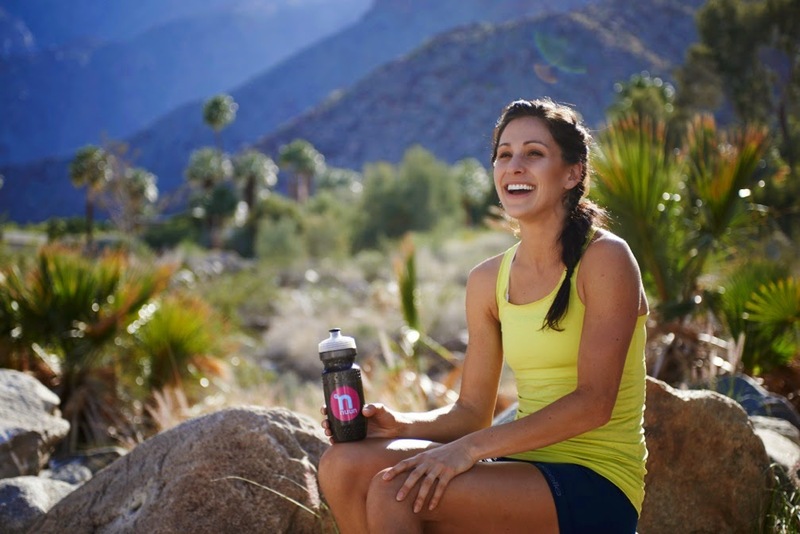 This is Kara Goucher and we both drink Nuun! We have so much in common! Ha ha! I am such a huge fan! I have the same bottle. I tend to get a little star struck with these speedy fast runners in case you haven't noticed. endurance output and cognition, and the same Optimal Electrolyte Blend as Nuun Active Hydration to keep you hydrated." Sound like a perfect mix of hydration and energy to get you thru your run! So of course I had to try it so I could be like all my favorite bloggers and runners who swear by Nuun. The Energy is awesome! Tastes good and definitely puts a little pep in your step! This is my collection of Nuun Energy! Pretty right? The generous souls at Nuun have agreed to let me GIVEAWAY a matching Kara Goucher bottle (black one pictured above) and 2 tubes of Nuun Energy! I can't wait for you to try the Nuun Energy and tell me what you think! Enter to win on Rafflecopter! 1 winner will be randomly selected via Rafflecopter. Open to US and Canadian residents 18 years of age or older. Winner will notified via email (if available) and blog post, and will have 48 business hours to claim prize. If original winner does not claim prize within 48 business hours an alternate winner will be selected. Contestants must enter on the Rafflecopter form in order to win. Prize will be shipped directly from Nuun. I've heard about Nuun on running podcasts, but haven't tried it yet. I want to try the Grape Raspberry Nuun All Day (and all of the other flavors haha). I hope you get to try it. I love it and can't run long without it. I would love to try the Cherry Limeade Energy Nuun. Love some caffeine to keep me going. I was on a Ragnar team sponsored by Nuun! I love mixing flavors - my faves are half a tab of strawberry and half a tab of lemonade or half tab of tea and half of lemonade. 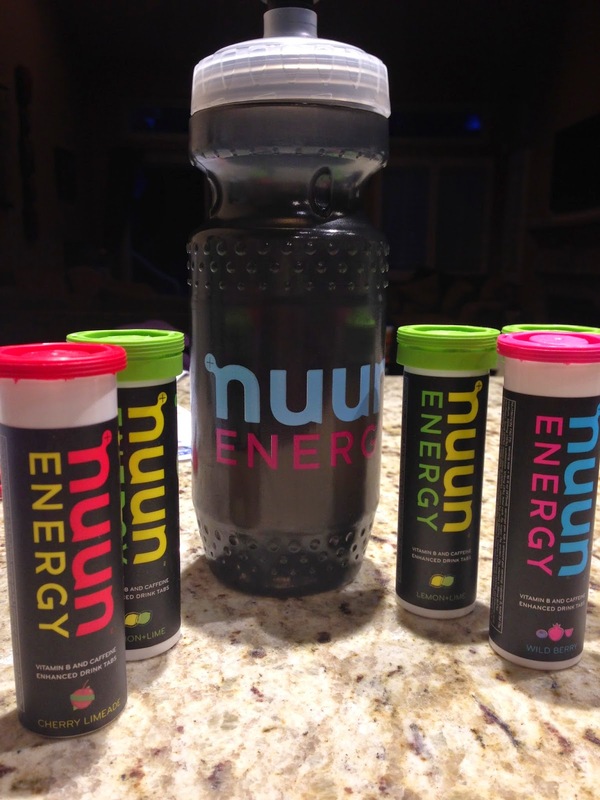 I haven't tried the new Energy Nuun and I would love to. Thanks for a great giveaway! I LOVE the cherrylimade energy flavor!! Thanks for hosting this giveaway!! I actually have the cherry limeade with caffeine at home that was the first I bought and I love it. That was before they redid as the black energy bottle with other flavors (which I saw the other day when I went to go buy a new flavor to try). I love Nuun and want to try them all. Haha. I love Nuun. Cherry Limeade is my favorite flavor. My favorite for a long time was the tri-berry, although I've been getting adventurous lately and I tried the strawberry lemonade, lol! It's pretty good! I am biased I think but I LOVE it! grape is my fav flavor! Thanks for the awesome giveaway! my favorite flavor is Watermelon!! I've had the Cherry limeade and really enjoyed it! Would love to try wild berry! Love Nuun Energy! Cherry Limeade for life! I would love to try the wild berry! My favorite is pink lemonade, but I would love to try watermelon! I've just started trying Nuun so I've only had Fruit Punch and Cherry Limeade and out of those I prefer the Cherry Limeade. Want to try more flavors though!! I have NEVER tried the Blueberry Pomegranate. Is that one of the the All Day ones? Grapefruit Orange would be great to try. It sounds so healthy. Thanks for the opportunity. I am a Huge Nuun fan! My favorite is Cherry Limeade. I buy it in bulk so that I never run out. HUGE NUUN fan! The hubs and I have a subscription on Amazon because we use so much. My absolute, hands-down, favorite flavor is Watermelon. Delicious! I LOVE the lemon lime NUUN. Very interested in this energy stuff. I love Kona Cola and Iced Tea. I don't drink soda anymore of any kind but I love cola flavor! I love the cola too! 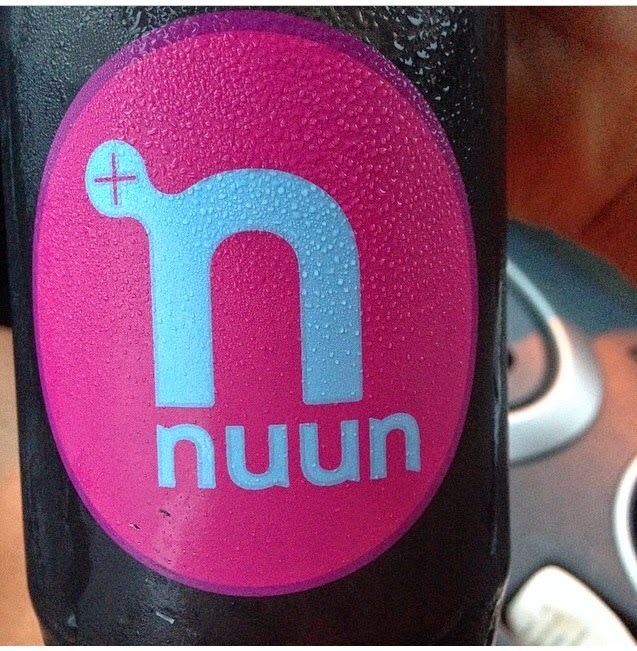 I like Nuun too. Strawberry lemonade is good. I love Nunn! Cherry limeade from the energy line is my favorite! But I've also tried the regular line and I like those too! My favorite Nuun flavor is pink lemonade, but I love all of them!! That's funny Sheena! Kona Cola and Lemon Tea are some of my favorites. I love Nuun! Watermelon is my very favorite, but cherry limeade is great too! My favorite is Tri-Berry, but I haven't tried them all. I'd love to try the Kona Cola! The Kona Cola is my FAVORITE!!! I'm dying to try the watermelon flavor. Can't find it locally anywhere!! I had the same issue and I ended up buying it an expo. Some flavors are easier to find than others. Love Tri-Berry and I've heard the Nuun Energy Wild Berry is very similar, can't wait to try it! Cherry Limeade rocks my world! Grape is my fave. But the cherry limeade sounds yummy! Love Grape, but I've recently discovered that I also like Cherry Limeade! I'd love to win! I like the berry flavors but am open to try anything! I've never had nuun. I would love to try the cherry limeade! Always looking to improve my hydration process for my runs; would love an opportunity to try Nuun Energy, and an awesome new water bottle to try it in! The Wild Berry and Strawberry Limeade sound really refreshing. Grape and fruit punch are my 2 favorites! I love the fruit punch! I really want to try the cherry limeade energy Nuun. I could always use some extra energy!